Nickel plated welded steel 'D' ring. Inside dimensions; A=11mm, B=13mm, C=2mm diameter wire. Supplied untested. Nickel plated welded steel 'D' ring. Inside dimensions; A=19mm, B=25mm, C=3mm diameter wire. Supplied untested. Nickel plated welded steel 'D' ring. Inside dimensions; A=27mm, B=32mm, C=3.5mm diameter wire. Supplied untested. Electro brassed welded steel 'D' ring. Inside dimensions; A=19mm, B=25mm, C=3mm diameter wire. Supplied untested. Elongated heavy duty nickel plated welded steel 'D' ring. Inside dimensions; A=31mm, B=32mm, C=5.5mm diameter wire. Supplied untested. Elongated heavy duty nickel plated welded steel 'D' ring. 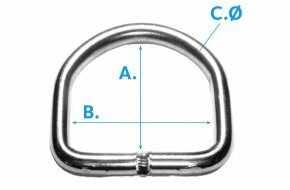 Inside dimensions; A=37mm, B=38mm, C=6mm diameter wire. Supplied untested. Elongated heavy duty nickel plated welded steel 'D' ring. 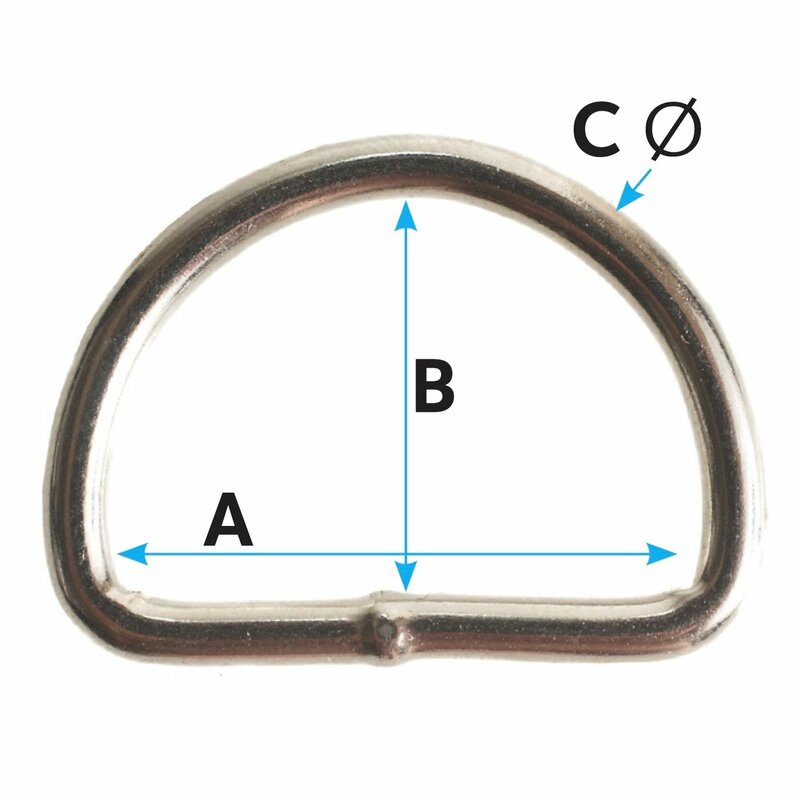 Inside dimensions; A=39mm, B=45mm, C=6mm diameter wire. Supplied untested. Elongated heavy duty nickel plated welded steel 'D' ring. Inside dimensions; A=50mm, B=50mm, C=6mm diameter wire. Supplied untested. 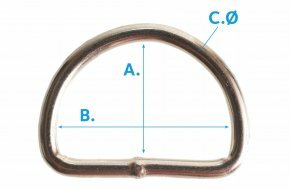 Elongated heavy duty electro brassed welded steel 'D' ring. Inside dimensions; A=27mm, B=25mm, C=5mm diameter wire. Supplied untested. Elongated heavy duty electro brassed welded steel 'D' ring. Inside dimensions; A=31mm, B=32mm, C=5.5mm diameter wire. Supplied untested. 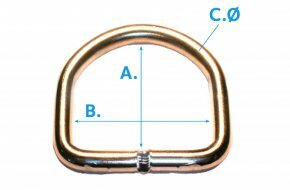 Elongated heavy duty electro brassed welded steel 'D' ring. Inside dimensions; A=37mm, B=38mm, C=6mm diameter wire. Supplied untested. Elongated heavy duty electro brassed welded steel 'D' ring. 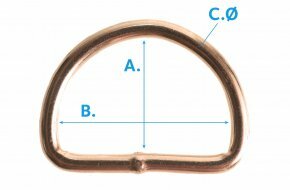 Inside dimensions; A=39mm, B=45mm, C=6mm diameter wire. Supplied untested. Elongated heavy duty electro brassed welded steel 'D' ring. Inside dimensions; A=45mm, B=50mm, C=6mm diameter wire. Supplied untested.